It seems these days people are in danger no matter where they go or what they do. 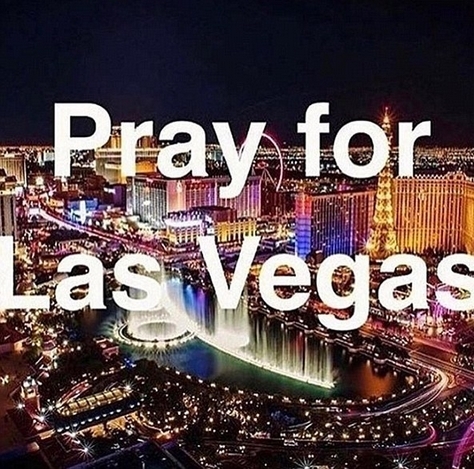 I pray for the victims of this senseless massacre. My prayer's go out to all those affected by this senseless tragedy . I also give praise to the Lord that my son who was just a few blocks away from the site , is safe . Senseless is right! We all need some time on our knees over this, and praying for the families forever changed by this heartbreaking tragedy. And now lawmakers are considering making silencers legal. Had people not been able to tell where the firing in Las Vegas was coming from, who knows how many hundreds more might have been shot. Don't be sucked in by this claim. I have a hearing disability from the military. I remember well the day it happened. 1966, I was qualifying with the M16 along with 25 other guys. The man to my left was less than 3 feet away and the noise from his M16 was deafening. Oddly the man to my right was 3 feet away and his gun noise didn't bother me. Why? Because the noise from the automatic (in this case specifically the M16) was not muzzle noise but the bolt and the piston that performed the automatic function. Had the person on my left had a silencer my left ear would still have incurred damage from the gun noise. Silencers do not work in real life as they appear to in the movies especially in a semi-automatic. This truly was a senseless tragedy. This individual apparently snapped. Our prayers have gone out to the friends, families and people of Las Vegas. Our blood has too as we donated in the past week and our local Blood Bank sent two shipments yesterday morning. One question Pat, have you ever used a silencer? The only place they truly silence anything is on TV and in movies. What they do accomplish is to lesson the report anywhere from 14 to 40 decibels. The sound with a silencer is still well above the hearing damage threshold. They found this disturbed man's room because the smoke detector had gone off - not because of the noise. He had ammonium nitrate in his room - he was considering a bomb - which could have resulted in even a greater loss of life. My question to you is why should law abiding citizens be prevented from purchasing a "muffler" (perhaps a more descriptive term)? This man was out to break the law any way he could. We haven't outlawed "fertilizer" (ammonium nitrate) when it has been used as a weapon (or cars, or pressure canners, or.....) Please consider doing some research so you understand what a tool or device is. Again, thoughts and prayers to all in Las Vegas, Puerto Rico, Texas and Florida. And in the burned out areas of the west. All are in need. --> Pat Suppressors not silencers. The projectiles from high powered rifles exceed the speed of sound and therefore emit a distinct "crack" when passing overhead. Think small sonic boom. Americans real enemies are now targeting Patriots, Christians, and Guns. They are intentionally provoking a civil war. Just exactly who are the enemies you ask? Well, if it is not American God Fearing Patriots with Guns, it must be the "few at the top" seeking to control the masses by removing your rights to Freedom and Liberty. Dare I say this ,this incident is VERY reminiscent of the prologue of Matthew Brackens' Enemies foreign and domestic..... just saying. I own 3 suppressors. I can assure you I can't put round after round down range without hearing protection. They are mainly for hunting where I want to quiet the report especially early in the morning for people that might be within ear shot of the area I'm hunting. The sound is suppressed enough that I don't have to wear ear protection when I hunt and they also reduce recoil. It took me a year from the time I filled out the ATF paperwork and $200 per suppressor in tax stamps. Like indicated by a previous poster do not believe the 'silencer' hype, this ain't TV.